With both menu items, you're next presented the File Open dialog to open a previously created model. 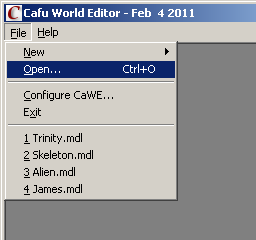 Note that while the Model Editor can load or import models from many different file formats, it can save models only in the cmdl file format that is specific to the Cafu Engine: Unlike any other file format, cmdl models files reflect all the model features that are implemented in the Cafu Engine. Tip: Especially the MMB can be helpful for effective navigation in the 3D view. Model details, scene settings and some dialogs of the Model Editor are presented in panes: Small windows that can be docked to the borders of the parent frame, or be “floating” freely on the desktop. If you grab a pane by its title bar and drag it over the screen, a translucent highlight will indicate where the pane will dock when the left mouse button is released. Press and hold the CTRL key while dragging the pane in order to prevent it from docking at all (it will remain floating instead). If you close a pane, use the appropriate item in the View menu to show it again at any time. Note that for most model elements, there are in fact two panes: One that shows the list of all elements in the model, and one that shows the details of the currently selected element. For example, the “Skeleton” pane lists all joints in the model, hierarchically arranged. Double-click any of them to bring up the “Joint Inspector” that shows the properties of the currently selected joint. On the following pages in this manual there is one chapter for each element type. Each chapter explains the model element type and its related “list” and “inspector” panes. The program menu provides access to all program features. Refer to chapter Menu and Toolbar Reference for a detailed description of each menu item. The toolbar provides quick access to the most frequently used menu items. Move the mouse over any toolbar button to see a tooltip that describes the purpose of the button.